Jakarta, September 26th 2014 – Scheduled to open at the end of this year, Archipelago International's upcoming Aston Anyer Beach Resort will mark an impressive milestone for the pioneering hotel management group. Gearing up to welcome its first guests in December, the opening of Aston Anyer Beach Resort will mark Archipelago's 100th Aston hotel. To honor this milestone, the 100th Aston property is set amidst a breathtaking beachside setting. Anyer, one of Java's most popular holiday destinations for Jakarta and West Java’s residents, is a beautiful west-facing beach town in Banten, famous for its stunning views of the sunset behind Mount Rakata. With plenty of beachside activities such as jet skiing, parasailing, riding a speed boat and other aquatic sports, the area is at once popular with families, couples and friends. Offering the perfect mix of both convenience and exotic scenery, Aston Anyer Beach Resort is located in the heart of Anyer, making it only a 90 minute drive from Indonesia's capital city. 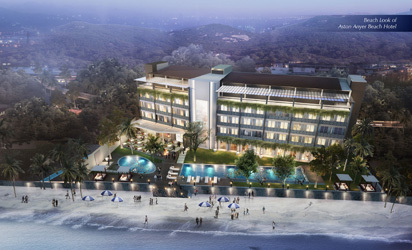 The hotel will feature 101 guest rooms and suites, and to cater to all types of travellers, there will also be a cozy all-day dining restaurant, recreational facilities including an outdoor swimming pool for adults and kids, a private beach, a pool table and ping pong table, a bonfire pit and a full service spa. There is even a modern conference center for the hotel's business guests, with 3 auxiliary meeting rooms purposefully built on the top floor to soak up the beautiful ocean views. Complete with an outdoor terrace, this breezy area is perfect for refreshing coffee breaks or dramatic sunset cocktail receptions. 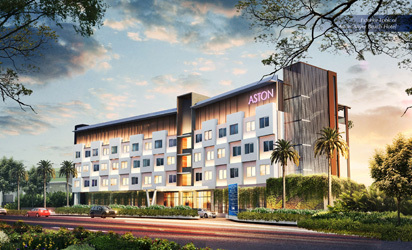 “Following the topping off ceremony in July this year, we are delighted to announce that our highly anticipated Aston Anyer Beach Resort will be the 100th hotel in our Aston collection. Anyer is a great location to mark this momentous milestone, with a huge influx of tourism from travelers of all types, breathtaking scenery and a stunning private beach to boot. We are very confident that this milestone will be one of many to come. Bookings can be made on our website at www.AstonHotelsAsia.com” said Mr. John Flood – President & CEO of Archipelago International. Exterior of Aston Anyer Beach Resort front view - West Java. Exterior of Aston Anyer Beach Resort beach view - West Java.